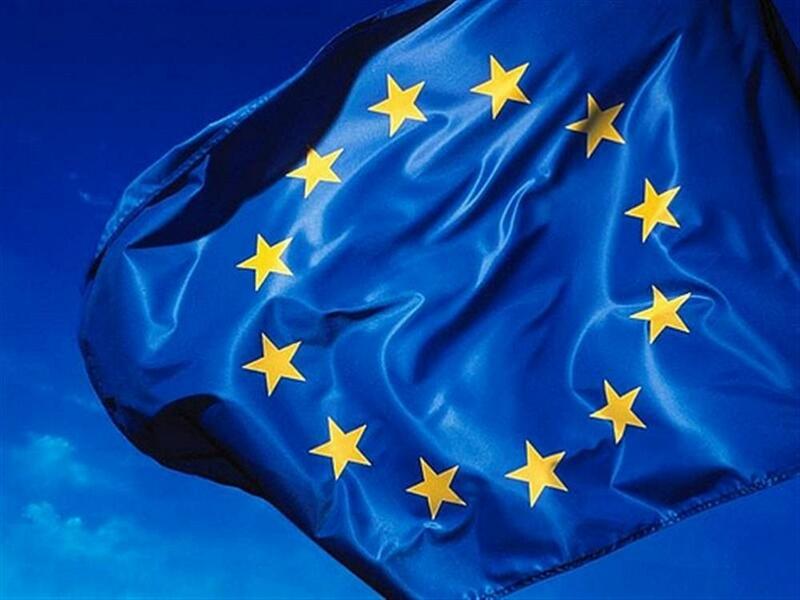 Miami is an ideal location for a European Union Center because it is the nexus of long-standing links among the Southeast Florida Region, Latin America and the Caribbean, and countries of the European Union. Connected by culture, travel and tourism, and extensive trade ties to our area, the EU has played a prominent role in the development of Miami into a vibrant multicultural metropolis. The larger EU countries maintain diplomatic and trade legations in Miami, and many European banking, finance, insurance and other firms maintain regional headquarters here. Imagine the international arena as a high school yard, where like-minded teenagers cluster in distinct groups. In such a setting, the United States and most European nations hang close in the center of the posh crowd – most of the time. When views and practices on the death penalty become the grouping criterion, however, America turns its back to the good kids and walks over to the bullies. 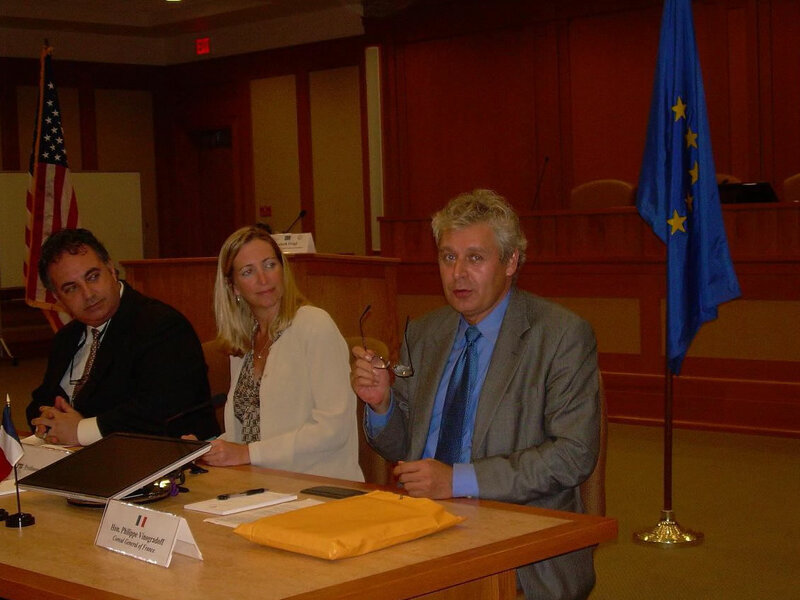 Philippe Vinogradoff, Consul General of France in Miami, and his German, Italian and Spanish counterparts came to the FIU College of Law Sept. 24 to serve as “the spark that ignites the debate” on the United States’ use of the death penalty. Long and spirited, the transatlantic exchange drew a large student audience. But it produced no convergence on a topic that reflects some of a society’s most deep-seated beliefs and character traits. Instead, it revealed unyielding chasms on the way the United States and Europe perceive punishment, redemption and how human life should be valued and protected. 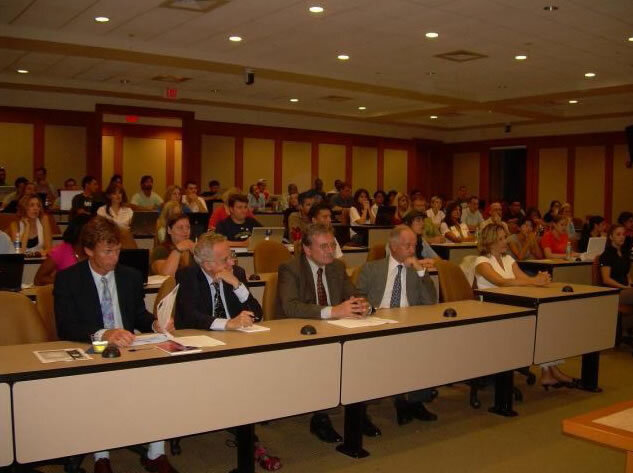 The debate was organized by the MiamiFlorida European Union Center of Excellence (MEUCE) at the law school’s Courtroom 1000. 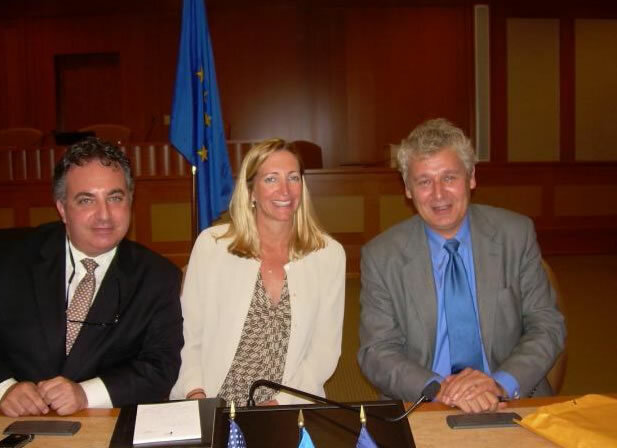 Apart from the Consuls General, the European contingent featured Sven Kuhn Von Burgsdorff, a member of the European Commission with a long career in diplomacy currently doing a fellowship at the University of Miami. On the U.S. side, Megan Fairlie, assistant professor at the FIU College of Law, gave an overview of the history and nature of the death penalty in the United States. Scott Fingerhut, assistant director of the law school’s Trial Advocacy Program and a fellow at the FIU Honors College, played the role of the devil’s advocate and made the case for the use of the death penalty. The death penalty in the United States has gone through different phases, itsapplicationprogressively narrowing, Fairlie explained. Until the mid-1800s, the penalty was automatic for certain types of crimes. After that, legislators started to recognize different levels of culpability, eventually limiting the punishment to capital murder. But, until 1972, juries enjoyed “unguided discretion,” resulting in the penalty’s arbitrary and racially-discriminatory application. In 1972, the Supreme Court ruled that this violated the Eighth Amendment, instituting a regime of “guided discretion” for juries. the opportunity to exchange notes on the issue with the European diplomats present at the debate. “This is kind of a brilliant opportunity for us to have a primary source,” she said. Professors Scott Fingerhut and Megan students after the debate. Vinogradoff said his goal was to promote awareness that standards of decency were changing in the rest of world, and world opinion has an impact on the United States.“It is a cause of a very bad image for the country outside in the democratic world,” the French Consul General said of the punishment. and acceptable. Besides, the death penalty is reserved for a very specific type of offenders and crimes; those that are violent, heinous, cruel and vicious. More importantly, it enjoys popular endorsement. “The Constitution is you,” said Fingerhut, addressing students present in the room. “We have to leave it in your hands.” Neither closure to victims’ families nor deterrence is this punishment’s primary goals, although its deterrence value is considerable, Fingerhut said. Rather, its function is justice, springing from the core of the American moral fiber. “It is pure American sense of justice, justice in the sense of retribution, justice in the sense of permanent incapacitation of dangerous murderers,” he said. The punishment derives its legitimacy from basic American values related to human life. As such, it constitutes “a complete respect for life and truly speaks for the people,” Fingerhut said.Respect for life plays out differently in the European worldview. “The right to life is an absolute right,” said Von Burgsdorff. He said the European view stems in part from Enlightenment philosopher Immanuel Kant. Kant posited that humans beings should never be made a means to an end, that no human life should be sacrificed to save however many others. Law students present at the workshop evoked incidents with mass loss of life to gauge the limits and flexibility of the European perspective. by the Miami European Union Center for Excellence (MEUCE) in 2007-08. Annual research grants ranging from €1,000 to €2,000 finance any research-related activity, such as travel and data acquisition, of faculty and Ph.D. candidates in several Florida institutions. Their purpose is to strengthen studies of the European Union, said Elisabeth Prügl, MEUCE co-director. his work in North America. that D’Souza is the first Public Administration student to receive a MEUCE research grant. On his part, D’Souza underlined the help he received from MEUCE and specifically from Prügl in establishing research contacts in Europe. An International Relations Ph.D. candidate, Ortoleva hypothesizes an identity shift in European Union foreign policy, from a “soft” approach, focusing on peace, justice and humanitarian issues, to a more traditional foreign policy orientation, geared toward defense and security. This shift, Ortoleva argues, stems from the influence of epistemic communities outside the Brussels EU apparatus, linked to the European defense industry. The grant will enable him to travel to Brussels and talk to members of the Political and Security Committee (PCS), an EU body made up of the political directors of the member states’ foreign ministries, as well as to members of think tanks with inroads to the PCS. The grant is open to faculty and Ph.D. candidates at Florida International University, the University of South Florida, the University of Central Florida, and the University of North Florida. EU: Patchwork Power or Unitary Actor? 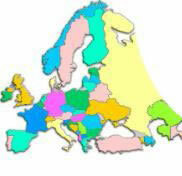 kind of actor Europe is in the context of global governance. The European Union does not fit the definition of a civilian actor, Coate said. A civilian actor is a power that accepts the necessity of cooperation when pursuing international goals, uses nonmilitary, mainly economic means to secure its national interests, and is willing to develop international structures to regulate international action. 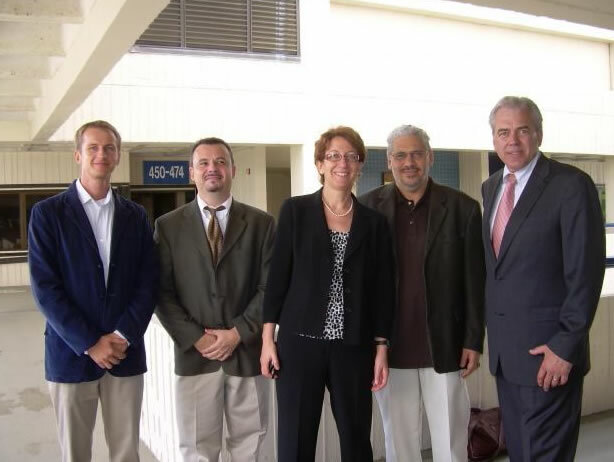 Dr. Mohiaddin Mesbahi and Dr. Roger Coate. representation,” he said. So far, the EU has used ad hoc solutions to external representation at institutions such as the International Monetary Fund (IMF), the G7 finance ministers, the Financial Stability Forum and the G20. But emerging markets and non-European countries have been exerting increasing pressure for a more coherent EU representation in international bodies. 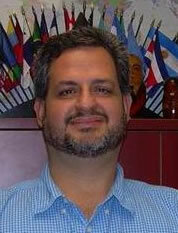 MARC building at Florida International University with a question to his audience. “Given this patchwork power identity for the EU, what are the roles for the EU/Europe in rebuilding effective global governance in global finance and security?” At the end of the lecture, students present took the opportunity to pick Coate’s brain. One undergraduate student asked what the best way is for the EU to help the United States during the financial crisis. Coates responded that the EU should first stop blaming the U.S. for the crisis and then strengthen its own position by acting coherently. unitary EU seat, the possibility may arise if the other members start to really push it. brands of cereal in your grocery store. And then think of how boxes of cereal and countless other consumer goods make their way to store shelves and display windows, within a constant arm’s reach of the Western consumer. The steep increase in the volume and diversification of consumer goods since the 1950s has spurred the need for much more efficient transportation mechanisms, a German professor told his FIU audience Oct. 8. Facilitating transportation across Europe, in turn, has required changes ranging from the construction of expressways to the opening of national borders. A guest of the Miami-Florida European Union Center of Excellence (MEUCE), Richard Vahrenkamp teaches logistics at the University of Kassel in Germany. He defined his subject as the study of the transportation, storage and transshipment of goods. His lecture at Green Library 220 illustrated the factors that led to high-performance logistics in Europe in the period 1945-2000 and the necessary changes that prompted the integration of the European economy. Vahrencamp divided the consumer-oriented economy in two segments, consumer goods and the retail trade on one hand and the automobile industry on the other. Both, he said, began their boom in the 1950s.Responding to the new need for quick and safe road travel but also to strong pressure from the car industry, European governments boosted their construction of expressways. Indicatively, expressways in France expanded to 6824 kilometers in 1990 from a mere 174 in 1960. The network of expressways formed the backbone of the post-1950s consumeroriented economy, Vahrenkamp posited, diminishing the role of railroad transportation. To support his main argument, that a consumer-oriented economy and high-performance logistics cause and rely on each other, Vahrenkamp juxtaposed the former with a Communist economy. Featuring a weak consumer goods sector and a low number of cars per capita, a Communist economy has no need to develop the infrastructure of high-performance logistics. As a result, the supply of consumer goods is haphazard and not adjusted to the demand. Vahrenkamp outlined how the need for fast and efficient transportation of goods led to the opening of many of Europe’s national borders. At the end of WWII, it was impossible for a loaded truck to cross a border. The cargo thus had to be unloaded and transferred behind the border to another truck. To facilitate the exchange of goods, an array of European institutions emerged, culminating in the European Economic Community (EEC) in 1958, which became the European Union in 1993. 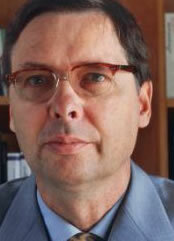 In the 1990s, Vahrenkamp said, several events came together to form the logistics revolution. These include the liberalization of transportation and telecommunications markets and postal services and the collapse of Communism. scholars. Facing him is MEUCE-FIU director Elisabeth Prügl. Creation of an Integrated European Economy Since 1945. It’s all about sharing difference. “I feel European when I get in touch and exchange with Europeans, with the diversity of languages, when I travel, when I cross borders,” German exchange student Stephanie Kessler told a group who gathered to explore what it means to be European. Hailing from a variety of backgrounds and enjoying distinct relationships to the continent, those present rejected a single, set meaning of Europeanness. “Using that word, European, is to limit someone to one identity,” said Belgian Tanguy Euben. “And European is a sum of identities.” What emerged from their exchange instead was a shared experience of cultures and people meeting, meshing, changing and retaining their distinctiveness at the same time. The presentations and the discussion that followed at Green Library 220 explored issues of overlapping regional, national and European identifications, cultural and linguistic diversity, unity and division, inclusion and exclusion and, ultimately, Europe’s nebulous borders of belonging. Skeptics have worried about staunch national sentiments precluding a European sense of belonging. But strong local attachments and close, shifting national borders sometimes make it easier to combine a local with a pan-European identification, bypassing the national scale. wondered whether and how immigrants may identify as European, especially if they have been denied access to or rejected the national identity of their host country. “Would the second generation, who may be having a hard time dealing with the dual identities already imposed on them, embrace a third?” she asked. For Braseby, who remembers Europe “even before the Common Market” differences may stand out more. 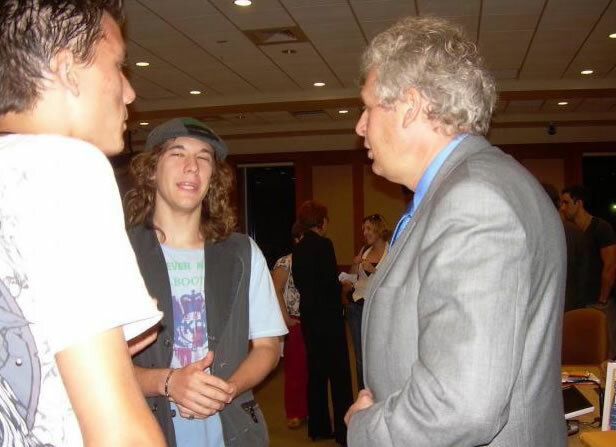 A native of former Yugoslavia who cherishes unity all the more after the breakup of his homeland held a different view.“The European Union provides this broad place for people to be welcome,” said Bosnian student Mirsad Krijestorac, who heads the student association that organized the roundtable. As Europeans pondered the ambiguity of their shared identity, an outside observer listed what she sees as the key features of Europe. For Marccia Moreno, a Colombian student who spent a year in Europe, fashion, food and the attitude toward leisure are the traits that make Europeans similar to each other and different from other parts of the world.“Europeans appreciate the time to eat by taking several hours and seem to work less hours during the week, just to take time for themselves or their families,” she said. If Europe is all this and then more, then whom would you allow to be European? Krijestorac asked, as a way to cap the discussion. Geography, culture, respect for democracy and human rights were some of the criteria listed. Braseby put it into one sentence.“Anyone who is willing to live in Europe legally, being as productive as they can, working, giving to the continent as well as taking from the continent,” she said. Krijestorac, a FIU senior in Print Journalism, heads a budding student group, Europe - Student Association. The objective, he said, is to transfer the European atmosphere of inclusiveness and dialogue, to create a place where, similar to Europe, people look to cooperate with each other. “We hope to create these personal connections between people,” said Krijestorac. The choice of “Europe” instead of “European” in the group’s name reflects the goal to bring together students hailing from Europe and students interested in Europe, Krijestorac explained. “We hope to become a bridge for these groups,” he said. FIU is home to numerous students who come from Europe as well as plenty of students who are interested in the continent, but currently these groups do not form a community, said Elisabeth Prügl, co-director of the Miami European Union Center of Excellence. “I think this [group] is going to be a tremendous tool for community building,” said Prügl, who encouraged Krijestorac to launch the association. Rebecca Friedman, FIU historian and the group’s faculty advisor, talked about these two groups coming together and creating an identity within the university. 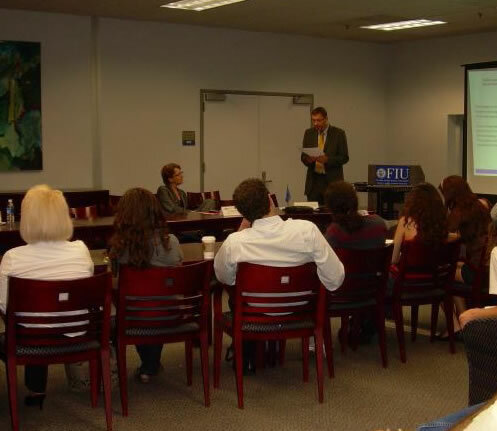 “They don’t all know each other and know of each other’s interests,” said Friedman, who also heads the European Studies Certificate program at FIU.Students who made it to the group’s first meeting on Tuesday, September 23, shared their ideas for the group. The group’s activities will include social, cultural and academic events, Krijestorac said, such as sports, dinners, film viewings, lectures, etc. Students and teachers from eight Miami high schools explored the hurdles and perks of different countries sharing a currency last April, in a learning-intensive yet fun competition that ended with a full-paid trip to the Big Apple and a shot at national recognition for two of the teams. 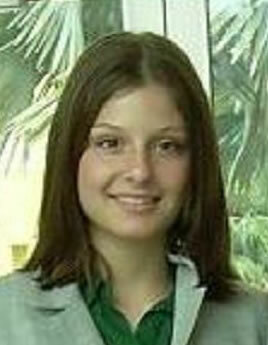 “Not only was I able to delve into a topic that enticed my teammates and I, but we were given the opportunity to share our passion for that topic as well, in front of expert judges,” said Molly Niedbala, a student at Miami Palmetto Senior High School. 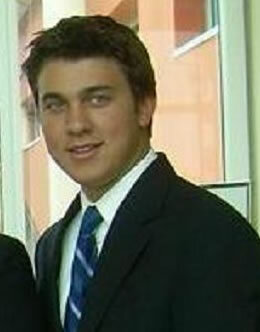 Niedbala and other Miami students took part in the Euro Challenge 2008, a competition designed to give students across the United States an understanding of the European economy and the euro, the currency shared by many of the Union’s 27 member-states. Insight in the workings of the world outside the United States and particularly Europe and its economy is precisely the goal of the competition, masterminded by the Delegation of the European Commission to the United States and launched with the help of the Federal Reserve Bank of New York, said Elisabeth Prügl, MEUCE co-director. Prügl stressed how knowledge seeps into the community through the small population of students and teachers trained. Students take it into their homes and peer groups, teachers pass it on to other students.“Teachers teach, teachers are multipliers,” she said.Prügl talked about an intensive process that involved local professors and officers from the Delegation of the European Commission to the United States and from Miami consulates of EU member states as training staff and judges. The competition was based on themes designed to explore the connection between a common currency and public policy, she said. Themes included how a common currency constrains or enables national governments when trying to forge policies combating high inflation or unemployment. won the local competition on April 8, but did not manage to defeat seasoned competitors from Northeastern high schools in New York. But, long-term benefits count much more, participants said. “The experience is one I will never forget and has helped increase my desire to pursue the study of economics in the future, especially in a broader view of international economics,” said Ralphie Harro, a student at Miami Palmetto Senior High School. Niedbala stressed the all-around gains. “In the process, we became more innovative, cooperative and, dare I say, cultured,” she said. Copyright (c) 2012 miamieuc.org. All rights reserved.